While dog owners often go the extra mile to make sure their furry friend is happy and healthy, it's not uncommon to let a few essential tasks slip through the cracks. One of the most overlooked parts of a dog's body is their ears. 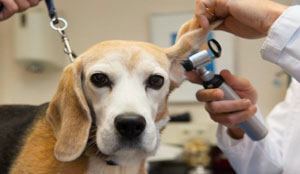 It's important that dog owners keep tabs on the condition of their dog's ears and regularly clean them to avoid potential health concerns. While it may be unpleasant for both the dog and owner, it's imperative to establish a regular schedule that utilizes safe methods of wax extraction and cleansing. Because a dog's ears are biologically complex, owners should take the time to educate themselves on why cleaning is important and how to do the job safely. Why Clean a Dog's Ears? A dog's ears are very different to that of a human's. The ear canal twists and turns, making it the perfect breeding ground for harmful bacteria. The ear can easily collect dirt and wax, which will lead to the growth of microorganisms. It's not uncommon for dogs to experience infections and other complications because of a lack of cleansing. There are a number of ﻿﻿﻿signs of infection﻿﻿﻿. They include redness, discharge, swelling, loss of hair, and discolored ear wax. If your dog is experiencing these symptoms, it's important to contact a veterinarian for professional care and cleansing. Regardless of whether or not the dog has short ears or floppy ones, dirt will work it's way into the canal and cause discomfort. Have you ever seen a dog scratch its ears? In many cases, this is the dog's attempt to alleviate discomfort inside the canal. 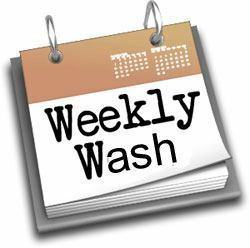 Ideally, the ears should be examined and washed on a weekly basis. Owners should make it a part of normal grooming practice, performing the task the same time the dog is brushed or has their nails clipped. However, it should be noted that owners should only clean the external parts of the ear. With regular care, the inner canal will stay clean and debris free. It's also important to clean the ear when the dog is exposed to water. Whether it's simply bath time or they have fun swimming, the ears need to be cleaned afterward. If water gets into the ear canal, it will lead to fungus and bacterial growth. Cleansing will halt this process. What's Needed to Clean the Ears? Before cleaning, it's a good idea to collect all of the necessary tools and accessories. Dogs don't necessarily enjoy the sensation of someone touching their ears, so it's not uncommon for them to squirm a bit. By having the tools ready, you can perform the cleaning swiftly. The main things you'll need for cleaning is a cotton ball and the cleanser itself. Gloves are recommended as well to ensure that bacteria doesn't make contact with your skin. If not, it's important to wash the hands thoroughly before cleaning. Pre-moistened wipes designed for ears are a quick alternative. Of course, treats to soothe and praise the dog are always a good idea. A variety of cleaning solutions are available to dog owners. Dog owners can choose to go with a homemade remedy using ingredients found around the house or with a ready made solution. Both options work well. A homemade solution is very quick and easy to make. Not only that, but it's very effective in removing wax and dirt. It's made from a combination of vinegar, boric acid, and alcohol. These ingredients are safe to use on the exterior of the dog's ear. The vinegar helps to control the pH balance of the ear while the alcohol kills off any harmful bacteria. 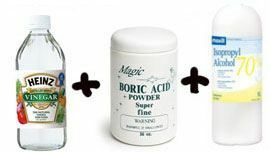 Simply mix 2 ounces of the vinegar with half a teaspoon of boric acid. Once these ingredients have blended together, add a few drops of alcohol. Mix and shake the recipe thoroughly prior to cleaning. This commercial cleanser contains all natural ingredients to cleanse the ear and prevent bacteria growth. It’s an antifungal and antibacterial solution that’s perfect for regular cleanings. The ingredients are also calming and painless, making the experience easier on the dog. It's a fast working solution that removes dirt and wax easily without the use of chemicals. The solution also acidifies the ear gently to balance the pH level and avoid yeast and bacteria. Overall, it's a great cleanser that's gentle on the dog yet effective enough to clean out any stubborn wax. The process of cleaning the ear is fairly simple and remains the same regardless of the solution you use. The trouble lies with the dog not cooperating, so it's important to provide comfort and praise. Also, supplies should be nearby because once the process is started it needs to be finished. Start by soaking a cotton ball in the solution and wringing out excess. Then swab the external parts of the ear, making sure to remove all dirt and grime. It may take a few cotton swabs to complete. Once you're confident in the external flap, work your way towards the canal. Make sure to stop when you feel resistance to avoid going in too far. Once the process is complete, let the dog remove excess solution and debris. They'll so this by shaking their head violently. The solution loosens up stubborn wax and dirt, so it should come flying out the ears with ease. If you don't clean your dog's ears regularly, you may notice a large buildup of wax in the canal. This is difficult to remove with standard cleaning, but it's important to do so to avoid infection. To accomplish this, the ear canal needs to be drenched with the solution. This can be done by placing a drenched cotton ball into the ear and massaging it from the outside. This action allows the solution to break up the wax while also soothing the dog. Simply wipe the dislodged wax up with a cotton ball and let them shake to remove excess. It's important to avoid using a syringe to introduce the solution into the canal. This is very dangerous when not performed by a professional, as you risk pushing the solution too far into the canal and causing damage. If the wax still isn't moving, it's time to let a professional take care of the job. Fortunately, once this stubborn wax is gone, you can avoid future buildup with regular cleaning. 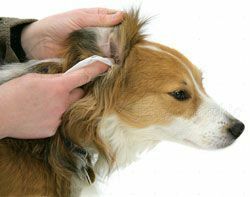 Proper and regular ear cleanings are a vital part of dog ownership. By regularly washing the ears to rid wax and debris, your dog will avoid a host of health issues. It's a simple process that uses simple ingredients and supplies. With time, the dog will become comfortable with the process and benefit in the long run. Also Read: Why Do Dogs Lick Each Other’s Ears?